Whether you’re just starting out or are already a fitness expert, integrating an exercise resistance band into your workouts can have some major benefits, especially for those that want to make gains anywhere they are. This All-in-One Resistance Band with Foot Support & Cushioned Handles provides you with a simple, reliable and comfortable way to make gains on the go thanks to its light weight and exceptional durability. Thanks to its compact size, you can take it anywhere you go to squeeze in a quick workout in your daily routine while at the office, on campus, traveling, or on vacation to help you get the exercise you need to stay fit and healthy. Our Pilatex fitness resistance band is adaptable for multiple fitness levels, allowing anyone to pick it up, start working out and get fit. 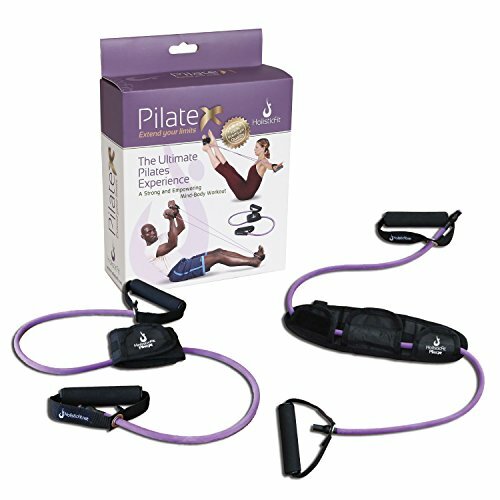 Thanks to the unique one of a kind design, it targets specific muscle groups by providing a full range of motion- allowing you to use it for all kinds of activities, workouts, and exercises while helping you stretch, strengthen core, build muscle, lose weight, tighten & tone your body and so much more! The HolisticFit Pilatex Bands for Workout and Training are extremely helpful for anyone recovering from leg, knee and/or shoulder-related injuries as well as for rehabilitation. The high-quality non-toxic rubber material ensures you stay completely safe. Click on the “Add To Cart” button now to order and to take your workouts to the next level and to live a healthy, active and fit life. GET FIT & STRENGTHEN YOUR BODY: Our workout bands are designed specifically to help you get in shape by providing you an easy way to increase the intensity of your workout, tone your body and burn fat right at home while staying completely comfortable. These portable and lightweight resistance bands are a must have for anyone that wants to get in shape and achieve the perfectly toned body you've always dreamed of! SUPERIOR QUALITY RESISTANCE BANDS: Each resistance band with handles is made of high quality, non-toxic, and super stretchy latex material that is completely safe to use yet durable & lightweight enough to handle even the most intense workouts. Featuring, durable handles, and a unique foot support, our rubber exercise bands are - exactly what you need to take your workout to the next level and get fit. LIGHTWEIGHT & PORTABLE: How many times have you missed your gym because of traveling? HolisticFit resistance stretch band with foot support is super lightweight and made to accompany you anywhere you go to provide you with the freedom to travel where you want without having to worry about missing your day at the gym. ERGONOMICALLY DESIGNED FOR COMFORT: Each Pilatex resistance band is made with our customers in mind to provide unmatched support and comfort. Our Resistance Bands feature cushioned handles that offer a comfortable and gentle slip-free grip along with being the only fitness resistance band to feature a Foot Support that provides better hold and many more possibilities for workouts. AMAZING FOR WORKOUTS & PHYSICAL THERAPY: These flexible and lightweight resistance bands help you target all the muscle groups and are extremely versatile in use. Excellent for Pilates, Yoga, Improving flexibility, Crossfit Training, Fat Burning, Muscle Building/Toning, along with being exceptionally useful for Physical Therapy, Recovery and to increase Mobility. If you have any questions about this product by HolisticFit, contact us by completing and submitting the form below. If you are looking for a specif part number, please include it with your message.